My beloved Spiritual Master, you are my life, my heart and soul. You are all I have and all I wish for. I beg to offer you my humble dandavats one thousand and eight times and then again and again. Let me spend my entire life in offering obeisances unto your lotus feet. I recall when I first became your fortunate disciple in 1968 I wrote an epic poem about coming to your lotus feet. You wrote in the margin “Very nice!” and then wrote me that you had sent it to Back to Godhead to publish. Naturally, I was encouraged, and so a few years later in 1971 in Brooklyn I offered Your Divine Grace a notebook of handwritten poetry. You shed your brilliant rays of light upon me, and embraced the notebook to your chest over and over again, turning it this way and that. You kept calling me “Poet” saying that this is one of the qualifications of a devotee. Even more encouraged, I set out to write Lord Chaitanya’s life in poetry. So some years later in 1976 on the rooftop of your apartment in Bombay, I told you about this epic poem in iambic heptameter with proper rhymes as per your preference; and that it would be completed in maybe two thousand verses. At that point you beamed like two thousand Suns. It is an indescribable experience to see you smile in that way, like being bathed in the transcendental light of Vaikuntha. How I cherish your smile, as I have learned to also cherish also your chastisements over the years. That which is pleasing you is all that is important to us, your disciples. For the most blessed event of Vyasa Puja 2010, I beg to offer a few verses of that project, which in your glorious service, is still ongoing and has yet to be published. Where Krishna, the Eternal Lord, holds Radharani’s hand. Eternal lovers share a bliss that’s never touched by time. The Sovereign Godhead and His Consort, passion shar’d sublime. Woodlands dance in euphony while rivulets cascade. Her skin is bright as molten gold and raven is Her hair. Where sinful schemes and lusty dreams are stirred by selfish wants. Lord Krishna’s love for Radha is like nothing of this world. No man can comprehend how much He loves this cowherd girl. Now poised, She hovers at His feet to tender flowers there. Shri Radha gives undying love, devotion is her prayer. While in His noble heart a hundred questions She inspires. “Shri Radha is perfection of devotion unto Me. Which soul-surrendered servant has a heart as soft as She? When I am not beside My love, Her heart is filled with dread. She feels each moment as twelve years, a path of anguish tread. That union with Myself alone will Radha satisfy? Or hears My mellow flute notes calling from a distant place? Her mood of love I’d need adopt those qualities to see. Can I begin to comprehend these feelings in Her heart? Thus Krishna puzzled over Radharani’s loving grace. And wondered what She felt within when lost in His embrace! When nectar waters churned, ‘tis said, the lunar orb appeared. The Ocean gave birth to the moon, so goes the tale we’ve heard. 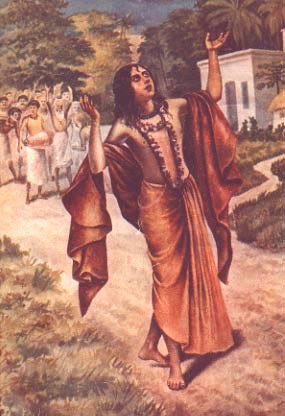 Mahaprabhu, Whose love’s so pure that universes lift! While nectar inundated earth from Krishna’s land above! A Saviour of all fallen souls, releasing us from chains. Five thousand years ago Vyasadev His birth foretold. Predicted that the Lord would come to cast off Kali’s Age. Would see the advent of our Lord, golden-colored, ever-bright. In serving mood He chanted, swooned, in sannyas saffron dressed. He sang the mahamantra loud, all souls who saw Him, blessed. He fell into a trance of love through chanting Hari Naam. While those of us whose wits are keen will worship Krishna’s Name. One only need devote his life, God’s glories to extol. And thus it came to pass Shri Krishna felt the love She knows. A loving mood for Krishna’s fathomed by the soul within. Will offer service unto God, His senses satisfy. The Lord appeared at sunset while the Moon eclipsed. The Moon, you see, was shy and hid his pock-marked face from sight. While spotless, golden Gaura Chandra ’peared on Earth that night. Devotees chanted “Hari Bol”, their faces lit with smiles. Beheld with father’s reverence the luster of his Child. Observed the Baby’s planets were in prime position found. The mystic sage saw through the veil that falls when God appears. Shri Shachi Mata styled Him Nimai for the neem tree there. She prayed that neem tree’s bitter taste the god of death would scare. For ominous Lord Yamaraj had snatched eight from her breast. She thus protected Nimai from all inauspiciousness. Until the village ladies sweetly warbled Hari Bol! Prophetic incidents, His transcendental fate foretold. As time flew past--to test the Child--the people gathered ’round. What choice would Baby Nimai make, His future thus revealed? And show His future task in life by grasping Bhagavatam! A cry was raised for fear that the Child’s life mission would be spoiled. That naga was Anantadeva, Lord Vishnu’s serpent throne. Two evil-minded thieves approached to steal His ornaments. The disappearance of her Child caused Shachi great dismay. They accidentally brought Him back to Shachi’s gratitude. Yet fortunate the criminals who gave the Child a ride! The Boy ran off to shelves of texts to have a careful look. Kind Jagannath and Shachi marveled at a sound they heard. This puzzled Nimai’s pious parents for his feet were bare. Astonished parents gazed at prints of feet unseen before. Unto the footprints of their Son, the two obeisance made! Refusing this the Boy instead partook of earth to eat. Said Nimai’s mother with a frown, “The difference can’t you see? “All things in Nature have their use, some single specialty. But when it’s formed as building blocks another use it’s got. The Child submitted and admitted Sachi to be right. His banquet came from Sachi’s breast much to her delight. Accepting from the master residence within his house. Quite naturally he wanted to maintain the pilgrim best. To offer rice to Krishna was this humble bhakta’s wish. Respectful prayers of honest love were more than ritual. And from this brahmin’s dish of rice the Child began to eat. It’s not accepted by Shri Murti, slighted and displeased. Yet still the took on the task of cooking rice a second time. The Brahmin set the Lord’s plate out, how lovingly he cared! Unnoticed Nimai’s conduct caused the same mishap again. He pirated this plate as well, much to his folks’ chagrin. It wasn’t until midnight that he’d finished up the chore. But somehow through a compound gateway agile Nimai climbed. Bewildered was the Brahmin when again the boy appeared. Recalling how the Lad had twice before that interfered. He contemplated calling Nimai’s folks from sleeping state. But Nimai told the Brahmin that his cries for help must wait. The child revealed Himself as Krishna to the guest’s delight. Absorbed in ecstasy the sage made Nabadwip his home. And often he would come to visit Mishra’s residence. To offer veneration unto blessed occupants. Could write out Krishna’s many Names and teachers satisfy. Upon the planets of the gods where lotus blossoms grow. The Child amazed His fam’ly members by the things He asked. As presentation to the Lord with hungry Nimai shared. Those holy foods for worship meant were cooked two miles away. Were likewise most astonished Nimai knew about their feast. For the Lord to eat on fasting days is neither sin nor whim. Though bhaktas must restrict their senses on Ekadashi. Were most upset by Nimai and the antics He would do. “Lord Shiva’s My devotee,” Nimai honestly explained. While others turned to Him with loving spontaneity. Annoying pandits was an art then mastered by the Boy. Bothering bathing Brahmins was by far His favorite joy. “I am the Object of your prayer and penance,” He would shout. The Brahmins could not meditate while Nimai splashed about. And marched unto His father’s house to tell what Nimai’d done. Now meanwhile Nimai’d left the ghat, a student free from care. His father and the pandits searched but found the Lad nowhere. His hands of spotted ink disproved what pandits had to say. He looked as though He’d just arrived there from the village school. How could His hands have spots of ink if He’d been in the pool? “Get milk of coconuts to rouse her,” came her friends command. That He must be the Son of Nanda in some other dress. He smears devotees’ eyes with love while sitting in their hearts.